Today I thought I’d share with you one of my favorite paintings, The Annunciation Triptych, also known as the Merode Altarpiece. 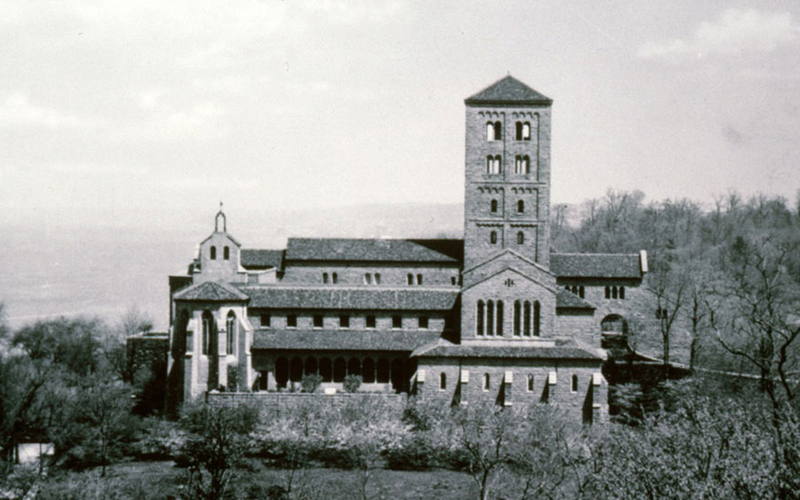 It’s housed at the Met Cloisters, a branch of the Metropolitan Museum of Art in New York City devoted to the art and architecture of medieval Europe. The medieval-looking structure, which opened to the public in 1938, is located in Fort Tryon Park on the northern end of Manhattan and overlooks the Hudson River. 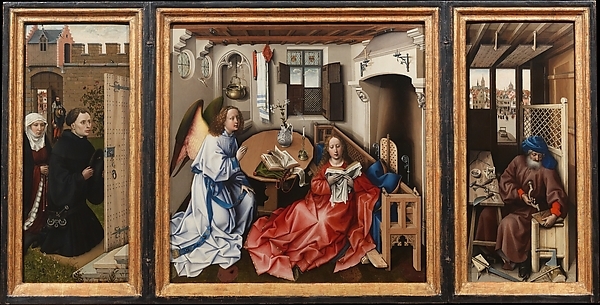 The triptych is credited to the workshop of Robert Campin, also known as the Master of Flémalle, and was painted sometime between 1427 and 1432 by him and at least two of his assistants. What fascinates me about this painting and all medieval art is the symbolism employed by the artists. There was a reason for each object and every color choice in medieval art. Some of the symbols in medieval paintings are familiar to us, such as the olive branch representing peace, but others have not stood the test of time and are unknown to most of us today except for biblical scholars and art historians. For instance, note the mousetraps on the workbench of the third panel, which shows Joseph working in his carpenter’s shop. Why did the artist choose to show mousetraps instead of something else a carpenter might make? It’s because mousetraps, according to the writings by St. Augustine, referenced the cross as the devil’s mousetrap. And we all may associate the apple with sin, thanks to the story of Adam and Eve in the Garden of Eden, but did you ever wonder why it was an apple Eve gave Adam and not some other fruit? The answer may have to do with the fact that the Latin word for “sin” is “malus” and for “apple” is “malum.” Can't get more similar than that. The Evangelists were each represented by symbols in medieval art: Matthew as an angel, Mark as a lion, Luke as an ox, and John as an eagle. The lamb was a symbol for Jesus (the good shepherd), and the dove represented the Holy Spirit and resurrection. Goats were a symbol of oppressors and unrepentant sinners. The lion was a symbol of strength and wisdom and also could represent the sun. Various objects in paintings also had meaning. Anchors represented hope. The lily represented purity. An eye, often pictured in a triangle with rays of light, stood for the all-seeing eye of God and could also represent the infinite holiness of the Trinity. The fleur-de-lis represented either the Virgin Mary or the Holy Trinity. Gates in paintings had hidden meanings, as well. An open gate stood for the entrance to Heaven, a closed gate represented death or exclusion, and a broken gate was a symbol of the powers of Hell. The three parts of the life cycle of a butterfly each represented something different. The caterpillar symbolized earthly life, the cocoon represented the tomb of Jesus, and the butterfly stood for the resurrection. Books, harps, keys, pearls, coins, even rocks and towers, are symbolic images in medieval art. The objects depicted in these paintings were all placed within the painting for a reason. Learning the hidden meanings behind these objects is like solving an ancient puzzle. Once you know key to the puzzle, you’ll have an entirely new understanding of medieval art and artists.